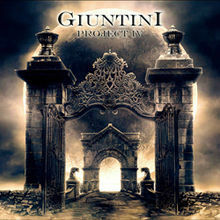 Review: "Giuntini Project: IV" - Sea of Tranquility - The Web Destination for Progressive Music! We have here the fourth release from Italian guitarist Aldo Giuntini's solo band Giuntini Project, and once again at the vocal helm is former Black Sabbath singer Tony Martin. Produced by guitarist Dario Mollo (who has also worked extensively with Martin), IV features an assortment of melodic hard rock & metal fare, with crisp, chunky guitars and the always impressive vocal talents of Mr. Martin. Tracks such as "Cured", "Born in the Underworld", and "I Don't Believe in Fortune" concentrate more on the 'song' aspect rather than an excuse for guitar pyrotechnics, though Also does throw in some blazing solos from time to time. Catchy, '80s styled anthemic hooks aplenty to be found here, and Swedish singer Liz Vandall even joins in on the fun with Martin on the engaging "Bring on the Night". IV is a fun hard rock album which probably suffers a tad from having too many songs, but at least there is a solid mix of catchy rockers and a few instrumentals for all the guitar lovers out there. Any time we get to hear Tony Martin is always a good thing, and it's very cool to hear him give a snarling take to Megadeth's "How the Story Ends". Solid stuff all around!